A multicultural hipster haven that still retains the feel of old Japan, all within walking distance of Umeda station. Going to Nakazakicho feels like stepping through the Narnian cupboard into a different world. Exploring the maze of lanes reveals vine-draped cafes, boutique restaurants, and a range of tiny, trendy businesses from yoga and tea shops, to galleries of handmade trinkets. Yet, the buildings are all reminiscent of the Showa era, a time in Japan that spanned the Depression and World War II. This is one of only two areas in Osaka that survived the bombings of the Second World War with buildings intact. A local legend claims that it was thanks to the ojizo shrines hidden within the twisty streets. These tiny, dainty shrines are home to ojizosama – statues that are believed to be guardians of children. Fifteen years ago, this was a purely residential neighborhood, frequented only by its elderly inhabitants. The impetus for Nakazakicho’s change was an ambitious Amemura-born dancer and performer, Jun Amanto, and the collective of artists and performers he inspired to join him in bringing the neighborhood to life. Born and raised in Shinsaibashi, Jun spent much of his young adult life performing in different countries, namely in Europe. He became fascinated with the cultures he was exposed to, and of course, asked many questions by curious Europeans about the exotic Japanese culture. Jun found himself bothered that he had difficulty describing Japan’s traditions, the Japanese way of life, and the meanings behind those traditions in his own culture, and decided to return to Japan to learn “what it is to be Japanese.” He began a three-year search to find a traditional Japanese way of life that still existed within a city, and his search culminated in Nakazakicho. Jun endeavored to set up in Nakazakicho in 2001. While celebrating Japanese culture, as an inherently internationally minded person, he also endeavored to attract other cultures into his world. As a result, Nakazakicho has slowly transformed over his time there into a vibrant and multicultural hub, with the support of a collective of artists called Art Eco Village. They work together with the neighborhood’s fast-aging property owners to create this unique, culturally diverse, artsy haven. Even today, however, more than half the buildings are empty. “Over here, it’s Malaysia. You’d like to find the Thai community? This is where they are. Korean? Over there,” he gestures. Jun sites his biggest challenge in developing Nakazakicho as overcoming the generation gap. At first, the elderly residents were nervous of the new, young, tattooed and pierced artist tenants, but they eventually opened their hearts and minds to Art Eco Village. Jun’s cafe, Salon de Amanto, was the first building to be renovated, after 10 years of semi-abandonment. The renewal was with 100 percent recycled material from the original shop. Used to working as a performer, Jun had to learn a lot of new skills, like carpentry, to make his dream come alive. “I had to learn everything when I started. Even how to make coffee,” he explained while carefully pouring the boiling water over the grinds. His dedication has certainly paid off. From the outside, the cafe looks like it is being consumed by the vines that hang down around the entrance, though inside it is spacious, cosy, and warmly lit. 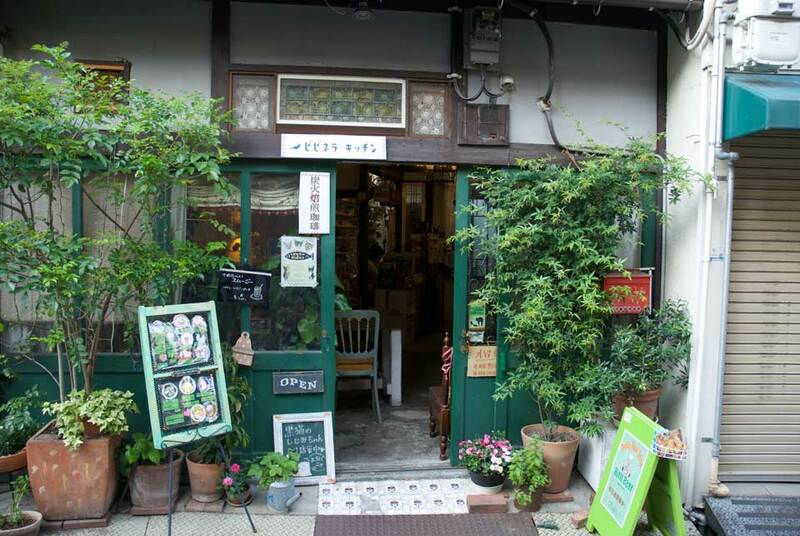 Like Nakazakicho itself, the style is retro, and there are little nooks to explore and relax in. Jun also runs a small movie theater that is open to rent by groups of at least four people. Naturally, he has a dance space, where yoga classes are also held, and there’s even a veggie cafe to address the shortfall of vegetarian options in Osaka. Nearby is the La Granda Familio, an organic, fair-trade granola shop run by Chiaki Sawada and her husband Yasuharu where the air is filled with the smell of roasting wheat and dried fruit. The couple was deeply affected by the March 11 earthquake in 2011, and created a “survival bar” called the Okoshi Bar that creates oraganic, high-calorie food specifically useful for when disaster strikes. They also have strong connections to preservation efforts in the Philippines, where they source the fair-trade bananas from. For pure coffee and visual enjoyment, Cafe Utena is housed in an old machiya (traditional wooden townhouse) on the west side of the neighborhood. The building has been restored lovingly, with an eye to an earlier era. The owner takes his coffee very seriously, but serves his brews in cheerfully colored cups, along with toast, or cakes. The quiet ambience, aided by a mix of natural light and old-school, yellow lamps, polished, dark-wooden furniture, old books, and a small garden beyond the window makes this a perfect place to settle in and while away an afternoon. Nakazakicho is an oasis in the heart of gritty downtown Osaka. Superficially, it can be enjoyed as a tourist, dipping into non-descript buildings to uncover the vintage second-hand shops within, or sampling the numerous pasta lunches on offer in the various quaint cafes. But there is much more to Nakazakicho than what meets the eye. It is the product of more than a decade of hard work, to ensure that both the traditional Japanese way of life, and ideas and traditions from other cultures, are shared and celebrated by both young and old. The best way to explore Nakazakicho is by wandering north of Nakazakicho Station on the Tanimachi Subway Line. Head out of Exit 2.